Valentino is looking for a loving family. The six-year-old male, along with four other dogs, was rescued from an abusive situation in a remote part of New Mexico. 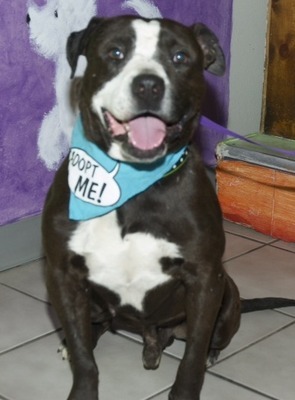 Valentino’s siblings have all found new homes, but this smiley, affectionate 55-pounder is still waiting for his. Valentino has not known much happiness or security in his life, and his rescuers are now hoping to match him with a family who can provide all the love and care he deserves. He remains sweet and gentle around humans, but becomes very stressed in the presence of other dogs. Valentino needs to be the only animal in his new home, but with an experienced, canine-savvy owner, he will thrive. If you’re interested in providing either foster care or a permanent home for Valentino, contact Alix at 505.795.2831.